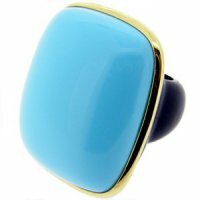 A large vibrant Turquoise and Ebony ring set with an 18ct gold rim. 35mm x 30mm approx. Gloriously designed in Italy by Eva Nueva. This impressive ring finished luxuriously in rich 18ct gold. The notable ring has a natural theme reverberating beautifully throughout Eva 's work. These designs are wonderfully unique.